After years with little acknowledgment of the damage caused to our environment through farming and manufacturing, Senator Gaylord Nelson of Wisconsin conceived the idea of Earth Day in 1969. On April 22, 1970, the observance of the first Earth Day was effective at raising awareness about environmental issues and changing public attitudes towards pollution. 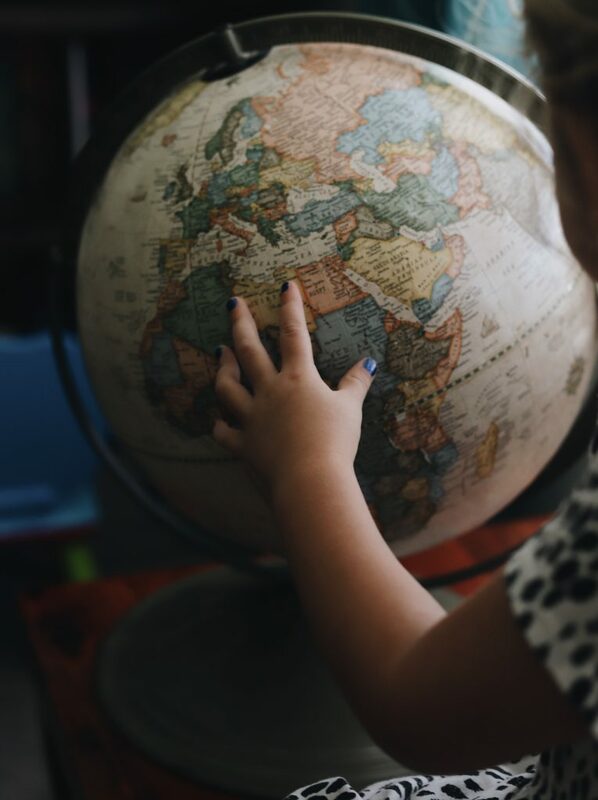 Since it’s humble beginning 50 years ago, Earth Day has evolved into a global celebration in over 174 nations and is the perfect time to discuss with our children the small choices every day that can contribute to meaningful change in the protection of our planet’s resources. 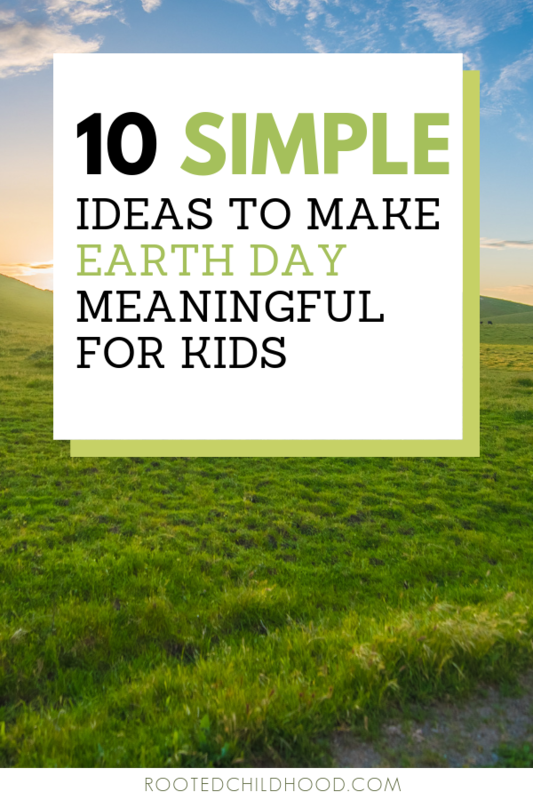 So instead of creating construction paper crafts that will eventually find their way to a landfill, let’s instead make earth day meaningful for our kids with these simple, no waste, ideas. Shutting off the water is something we probably try to do already, but our children don’t always remember to turn their water off while brushing their teeth. However, on average most faucets have of flow of roughly 2 gallons per minute. Yikes! If we leave that water running while we brush our teeth twice a day, that’s a loss of approximately 3 to 4 gallons of water per person. Not to mention the resources used to create and deliver clean water to your home. As a simple activity for Earth Day, measure how much water flows through your faucet in one minute. You can then do the math and demonstrate to your kids how much water you are merely sending down the drain when they leave the water running. Yes, this is a common activity for Earth Day, but for a good reason. The effects of deforestation are significant, and trees provide so much benefit to the environment. Trees produce oxygen and filter out air pollutants, they help preserve water levels in the soil, and cool and shade homes thereby reducing energy consumption. So find a nice spot in your yard to add beauty by planting a tree. What parent hasn’t told their kids to turn off the lights? This seems to be almost cliche. However, another simple Earth Day project would be to have your kids research the best conditions for turning lights off or leaving them on. The Department of Energy has an excellent articlethat takes into account the type of bulb and the cost of energy when determining the effectiveness of light usage. Have your children do some research and account for thet types of light bulbs in your home, and then decide whether or not it’s best to leave certain light bulbs on or off, and for how long. Unfortunately, nine-tenths of all solid waste in the US is not recycled, even though 75% of our waste is recyclable. The potential to decrease the input to our landfills is enormous. Just recycling a single plastic bottle saves enough energy to run a 100-watt bulb for 4 hours. It also creates 20% less air pollution and 50% less water pollution compared to creating a new bottle. Fortunately, efforts to increase recycling are growing and you can often find a recycling bin sitting next to a trash can. So take the extra step and recycle what you can. Also, see if you local recycling station offers visits. A field trip to a recycling center would be a memorable Earth Day activity. All those vegetable and fruit scraps are soil in the making. Currently, food scraps and yard clippings make up 30% of what we send to our landfills. This could be composted and reused right in our yards. Composting also enriches our soil and reduces our need for chemicals. So another activity to do this Earth Day, that will benefit your family all year long, is to start composting. Whether it’s a simple pile, or an elaborate tumbler, your children can learn about decomposition and the creation of soil. Plastic bags have become an everyday part of our lives; however, 8 to 10% of our total oil supply is used for the creation of plastic bags. That’s a considerable amount of a limited resource. An average American throws away ten plastic bags a week, over a year this is the equivalent of driving 60 miles. It can also take hundreds of years for a plastic bag to decompose. This is undoubtedly an area in which we all can do better. This Earth Day, have your kids place all your reusable bags in the car, so you have them whenever you’re out. Hopefully, this will keep us from being forgetful on our next shopping trip. Another great activity to make Earth Day meaningful this year is to donate those gently used, but no longer needed items to charity. Clothing is especially beneficial to donate because it reduces the production of additional synthetic materials, decreases the environmental costs of production and distribution of new clothing, and some clothing can even be recycled just like plastic, paper, and aluminum. So go through those closets this Earth Day and give items to charity so that another can gain use of an already produced article rather than buying new. A truly simple, but meaningful, act on Earth Day would be to take a walk through your neighborhood or local park and pick up litter. Unfortunately, litter is easy to find, but children can immediately see the beautifying effects of their efforts. Doing a little clean up is a quick and easy Earth Day activity kids will remember. Everything in our society has become so disposable, it can almost seem radical to try and repair rather than replace a broken item. Sadly repairs are often more costly than simply trashing the broken item and purchasing a new one. So whenever possible, we should find creative ways of repairing and reusing items rather than buying new. Repurposing is also a great exercise in problem-solving for your kids. Have them look around and creatively reuse something you would otherwise throw away. Who knows what clever ideas they will produce? According to ColdWaterSaves.com, 90% of the energy used in washing our clothes goes towards heating the water. Think of all the energy saved by merely switching to cold water for most of our washing. By washing just 4 out of 5 loads in cold water, we could reduce our carbon emissions by 864 pounds, which is the equivalent of plating 37 acres of forests. We also measure the energy necessary to heat water in BTUs (British Thermal Units), which is the tradional unit of measuring heat. Earth Day would be a great time to research both the science and history of BTUs. Cold water is gentler on your clothes, which increases their life-span, thereby reducing the energy needed to produce new clothing. So if you need to do some laundry this Earth Day, switch that water temperature to cold. There are many ways we can make Earth Day more meaningful to our children other than creating a craft. Yes, those are fun and can get the conversation started, but children want to see that what they do has meaning. By showing them the small things they can do every day which over time will benefit our planet and her resources, we are educating them about the impact of their choices. 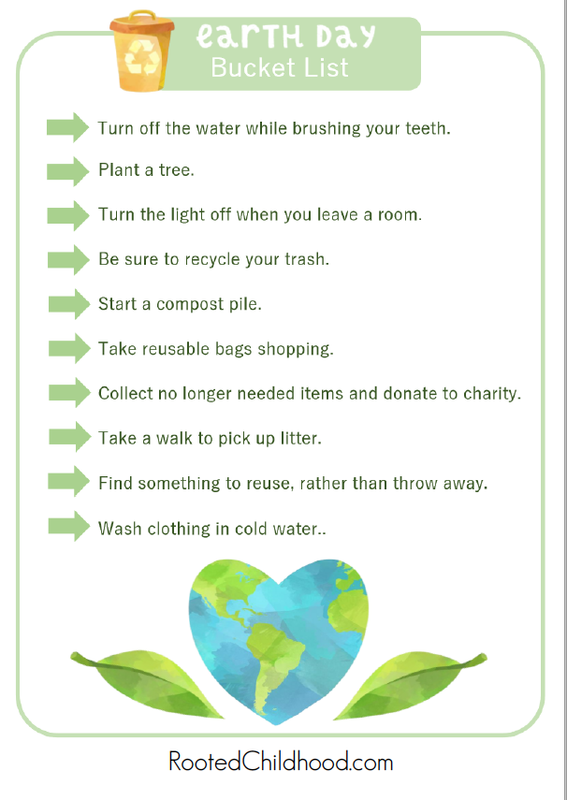 So pick a few of these activities and bring some meaning to Earth Day this year. These are life lessons they will always carry with them and help shape their attitudes towards consumption. Looking for ideas on how to celebrate Earth Day with kids in a meaningful way? We've got you covered! Sign up to receive the free download plus more ideas and inspiration to connect with kids in meaningful ways. Yes, please! Send me the download! Your privacy is important to us. Your email address won't be shared and you can unsubscribe at any time.